Hello friends!! Have a little card to share with you. Our weather here in Western Washington has been really bad and that means lots of time inside to do some crafting. But I have been experiencing a wee problem... no mojo! Finally got some by making a card using some brand new Penny Black stamps and the current Sketchbook Saturday sketch. Penny Black has some of the most beautiful poinsettia stamps and they have done it again with a new one called "warm wishes". The moment I saw that stamp I had to have it.. and now I do!! YAY!! I started my card by stamping the image on some patterned paper from Stampin Up! called Winter Frost using watermark ink. I applied silver embossing powder, heat set the image and then trimmed it out. Some glue was applied to the center of the flower and I poured on some light blue glitter. The banner (from the Penny Black set "Christmas banners") was stamped on pale aqua cardstock using watermark ink, silver embossing powder applied, heat set and then trimmed out. Additional papers from the "Winter Frost" pad were cut and layered per the sketch and the flower added to finish things off. On Thursday I got the chance to shop at my favorite stamp store, Impress Rubber Stamps, with my friend Cindy and picked up a few things like the washi tape I used on my card. I paired that tape up with some orange striped tape and this great Halloween sentiment from the Waltzingmouse Cicely at Halloween set. In order to use the sentiment I had to turn the sketch on it's side. I finished this simple card off with some orange and black sequins. Hi friends... I'm back with a little card to share that I made using some absolutely yummy new Prima products. 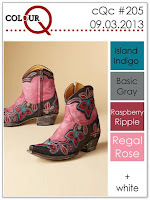 The CardMaker blog design team is having a little product spotlight feature with the Prima design team today. 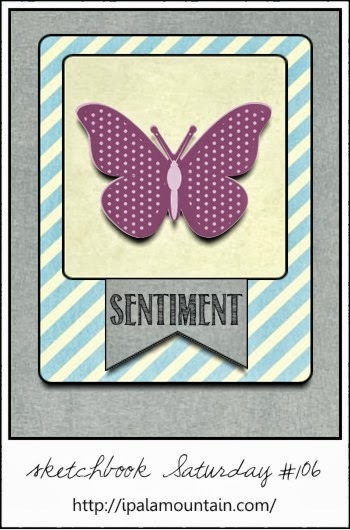 Click over to the CardMaker blog to check out what my team mates made. I was fortunate to receive products from the new Prima line "Anna Marie". Like all Prima products the papers and embellishments are just gorgeous!! 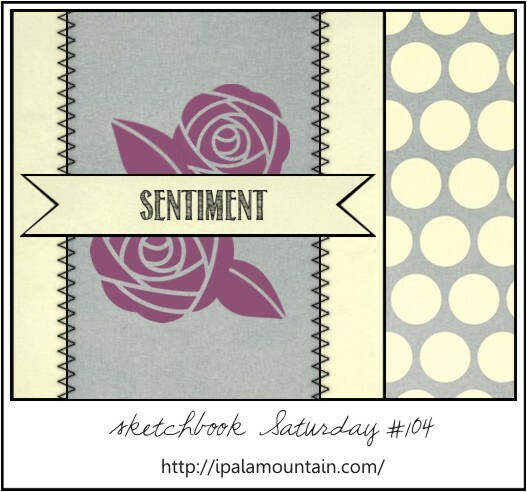 The design of my card is based on the current Sketchbook Saturday sketch. One of the goodies I received were these gorgeous resin butterflies and I just had to use one on my project. 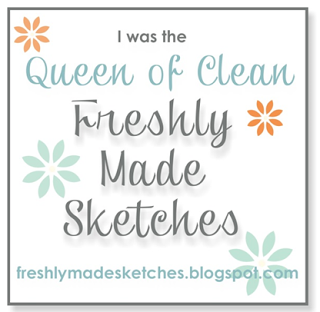 Obviously I followed the sketch to a "T", lol!!! 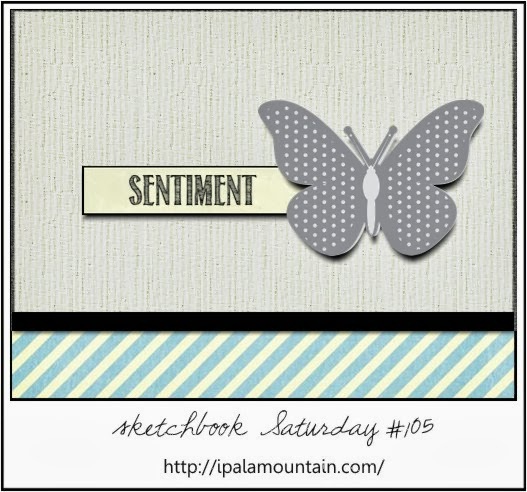 With that butterfly the focus of my card I kept everything else fairly simple. A fun little pleated treatment was created for the bottom of my card. I finished off the card by adding a few brads and Sugar Dots from the "Anna Marie" line, as well. Hello friends... it is a wet, wet day here in my corner of the Pacific NW! Another day to stay inside and craft... hopefully I will get the chance!!! 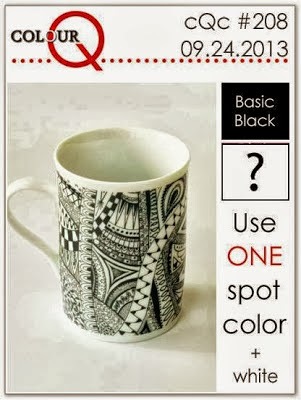 Last month I wasn't able to play along with PTI's monthly blog hop so was determined to participate this month. Managed to make a clean and simple little card last night. 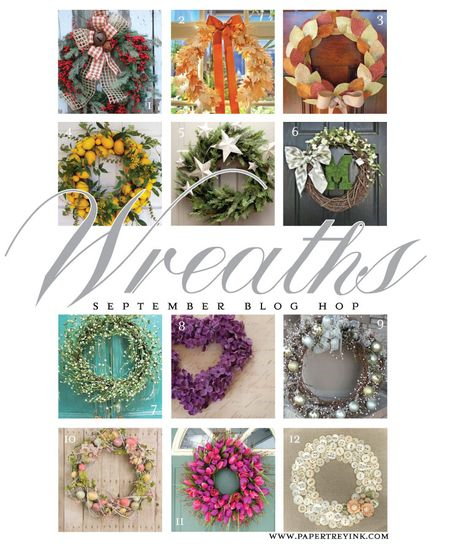 This month's challenge is to make a project with a wreath on it. I don't have any PTI wreath stamps, but I did have an idea that came together rather nicely once I got to work. The twiggy wreath is a Memory Box die that I cut twice from PTI's kraft cardstock and then layered together. The flowers are from the PTI set Bigger Blooms. Since it is now fall I went with a fall color scheme of pumpkin orange, rust, soft yellow, olive green and light green. After die cutting and stamping all the flowers and leaves I created some texture on the background cardstock using my trusty piece of burlap and my Big Shot. And then roughed up the edges a bit for a more rustic feel. The wreath was layered on top and then the flowers arranged. I finished off my simple card by stamping the sentiment inside the wreath using Rich Cocoa ink. Hello friends!! Happy Tuesday to you... hope your week is going well!! And since it is Tuesday that means it is time for a brand new cue word!! Loved all the fun arrow inspired projects that filled the gallery. With fall now here our cue word is "autumn". I know there will be tons of fabulous autumnal projects this week! Our special guest designer is super talented LeAnne!! All the challenge details can be found here. 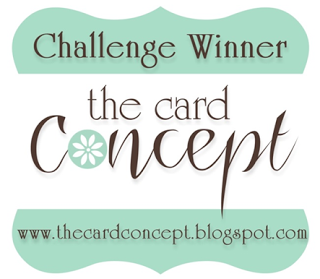 The layout for my card is based on the current sketch from CTS. Instead of going with a rectangular shape shown in the sketch I decided to die cut a leaf from burlap. After die cutting the leaf I crumpled it up a bit to give it more dimension. To give my card a bit more of a rustic feel I embossed the rustic white cardstock piece using my woodgrain embossing folder. 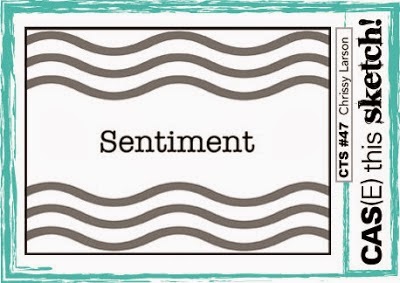 The sentiment, from the Reverse Confetti set "Forever Fall" was stamped using Rich Cocoa ink and die cut using a MFT Fishtail Flag Stax die. A bow was made using a piece of red twine and then adhered to a tiny clothes pin. The clothes pin was attached to the banner and then the banner and leaf were adhered to the embossed piece and mounted on a kraft card base. Since I used Reverse Confetti stamps for my card I'm going to link this up to this week's RC Fetti' Find list. Hello friends!! It is a gloomy Sunday here in my part of the world... rain, rain and rain! Oh well... just makes for a nice day to stay inside and do some crafting, right? 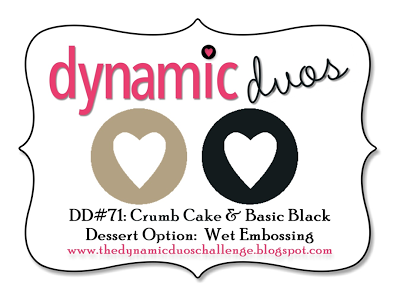 Have a somber little card that I made using this week's Dynamic Duos combo of kraft and black. 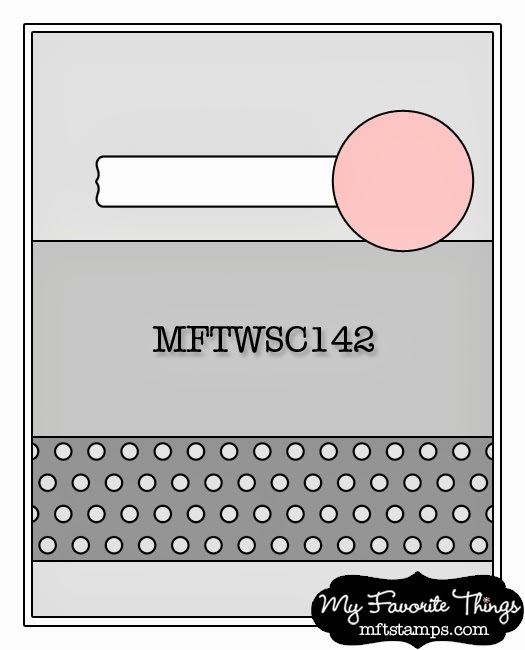 The layout is based on the current MFT Wednesday Stamp Club sketch. On Friday I received some happy mail in the form of new stamps from MFT. One of the sets was the MFT/LJD Splendid Sunflowers so I just had to get it inky. The Dynamic Duos combo presented a bit of a challenge, but I think the card turned out rather nice. I stamped the sunflower using SU! kraft ink and then added the center using Memento Tuxedo Black. I trimmed out the flower since I wasn't able to buy the matching dies (yet!) and then attached a kraft button using some black hemp twine. The black panel was die cut using the MFT Die-namics Dispersed Dots die and adhered to the cream cardstock. A piece of PTI gingham kraft patterned paper was cut to fit the cream panel and adhered. I die cut a fishtail banner using a MFT Jumbo Fishtail Flag Die-namics die from cream corrugated paper and adhered that to the gingham paper. The "hi" was die cut from black cardstock using the MFT Hi-Rise alpha dies and adhered to the fishtail flag. Finished everything up by attaching the sunflower with foam dimensionals and then the entire piece to the card base. There you have it... a somber sunflower! Hello friends!! Had a chance to play along with this week's PTI Make it Monday. Dawn McVey's card is just too cute and so I had to play along. 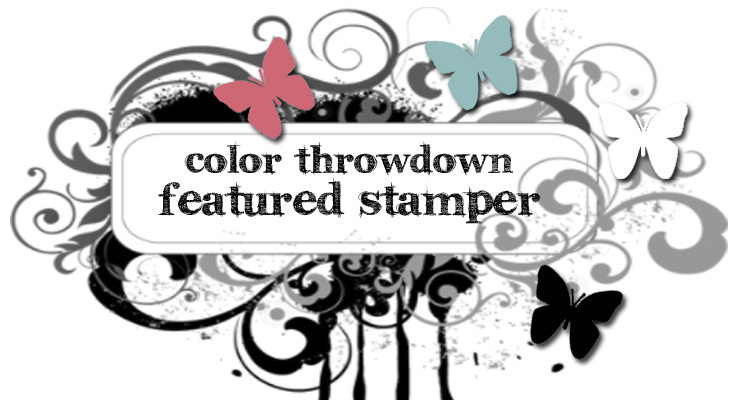 The CAS challenge over at Splitcoaststampers was a color challenge (hot pink, navy, grey and white) and I used that color combo for my card. I pulled out my PTI Rosie Posie stamp and die set, some patterned paper from the Teresa Collins Memorabilia 6x6 pad and got to work. I die cut three scalloped borders from the grey patterned paper and layered them on the bottom of the white cardstock piece and a thin strip of white cardstock adhered. I die cut the leaf and flower images from white cardstock and then stamped each die cut with the corresponding image from the Rosie Posie set. The flower was layered on the cardstock piece, a little tag from PTI's Tiny Tags was stamped with the sentiment using navy ink, a bit of hot pink cardstock was adhered behind the heart and the tag was attached with a tiny bow made from grey bakers twine. Mounted the piece on a white cardstock base. Hello friends!! 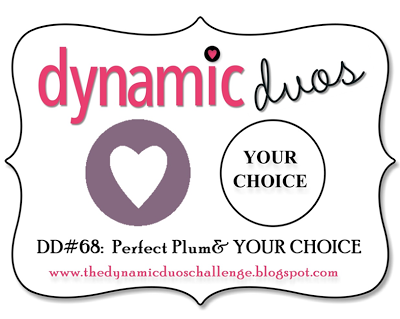 Popping in with a card that I made for this week's Dynamic Duos color challenge. 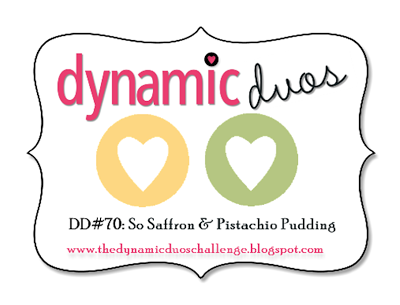 The colors this week are So Saffron and Pistachio Pudding... a soft yellow and a soft green. 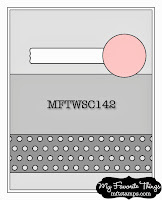 Given that the colors are so soft and pretty I wanted to use pretty feminine stamps for my card. What did I reach for? My SU! set Everything Eleanor! I started by stamping the medallion image from the set using SU! 's Crumb Cake. Over that I layered the flourish image using VersaMagic Aloe Vera ink. The sentiment was added using Memento's Rich Cocoa. The flower was stamped on So Saffron, trimmed out and adhered using foam dimensionals. Punched the corners of the matt and the stamped piece using my SU! ticket corner punch and then layered them on a Pistachio Pudding card base. Just a simple little stamped card, nothing fancy, but honestly one of my favorite kinds of card to make! Hello friends!! Tuesday has rolled around once, again, and with it a brand new CASology cue word. There were some seriously fabulous entries for last week's "silhouette" challenge! All I can say is ladies you ROCKED that challenge!! But I digress and must get to the point (hee hee!) 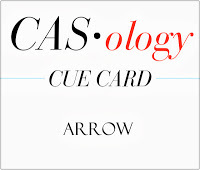 of today's post... revealing this week's cue word: arrow! Arrows are super trendy right now so I know that all you super crafty gals will be filling the gallery with amazing amounts of fabulous!! All the details for the challenge can be found here. And joining us this week in the guest designer spot is the very talented Janet!!! 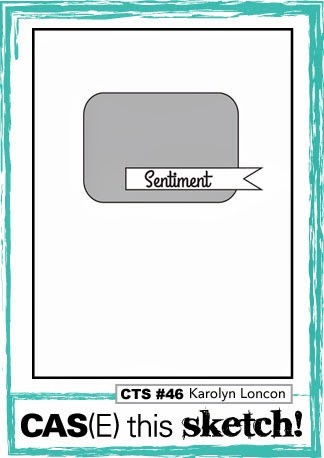 Quite some months ago I purchased some fun little paper clip thingies from Stampin Up! The assortment contains little clothes hangers, speech bubbles and arrows. So I knew I just had to use one of them on today's card. I don't own many sets with arrows in them, but I did purchase this fun MFT/LLD set called "Mod Borders" that has some fun arrow borders. I decided to go a bit bold and stamped the arrows using Mememto Dandelion ink. As the border image was longer than I needed I simply masked off a portion using a post it note then inked up the remaining portion and stamped. I thought the sentiment (from the MFT/LJD set "On the Line") fit perfectly with the bright yellow. I stamped it in Tuxedo Black and then die cut it with a Spellbinders plain circle die. One of the arrows was attached and then the sentiment was matted with a circle die cut from black cardstock. The piece was then attached and I was done. hanks for stopping by... ...I cannot wait to see what fun "arrow" ideas all you super talented paper crafters come up with for this challenge!! In the meantime make sure you check out the cards from the rest of the design team: Melissa, Judy, Meghan, Ardyth, Gillian, Maureen, Kimberly, Jen and Tracey and our guest designer, Janet! Hello friends!! Woke up this morning to thick fog. Since we live a on ridge above the Puget Sound and the Port of Tacoma is our neighbor, we have been hearing the foghorn all morning! (As I have been writing this post it has started raining and there is thunder and lightening. It is a bit weird, though, because it is still foggy and so I haven't actually seen any lightening...just heard the thunder!) Have a little card that I made using another one of the Penny Black "Colorful Christmas" color combos. I hope that you have checked out all five of the combos and are going to play along. There are three prizes up for grabs... who doesn't like prizes??? The layout for my card is based on the current sketch from CAS(E) this Sketch. I used the following Penny Black stamps: winter berries (4273K) and time (4261F). My card is fairly simple, but a little labor intensive because it involves stamping the "winter berries" image multiple times. I cut my piece of Rustic White cardstock to size and then began stamping portions of the image using Hero Arts Field Greens ink. I then layered on VersaMagic Aloe Vera ink and finished with VersaMagic Thatched Straw. 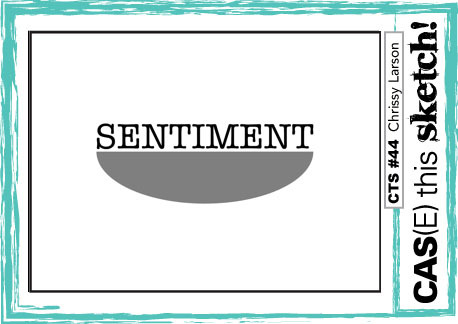 The sentiment was stamped using Tuxedo Black ink. I mounted the piece on some PTI Fine Linen cardstock to bring in the fourth color in the combo. I recently purchased a couple of Zig Wink of Stella markers and used my green one to add a little bit of glitter to some of the dark green dots, but it doesn't really show up. Supplies: Cardstock: PTI Rustic White & Fine Linen; Stamps: Penny Black; Inks: Tuxedo Black, Thatched Straw, Aloe Vera, Hero Arts Field Greens; Zig Wink of Stella Green marker. Hello friends!!! 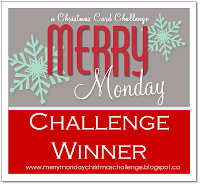 On Monday I had a short post about the new challenge going on over at the Penny Black blog. 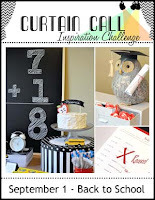 Each day this week a new color combo has been revealed on the blog. The final color combo was revealed today and I have made a card using that combo. Even though the Penny Black challenge is all about Christmas I decided to make a fall card as the combo just said "fall" to me. 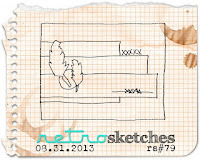 The layout for the card is based on the current sketch from Sketchbook Saturday. I started with a kraft card stock base and added a layer of mustard yellow card stock (Stampin Up! More Mustard) that had the edges distressed. I cut a piece of patterned paper from the Crate Paper Farmhouse 6x6 pad, distressed the edges and layered it on top of the mustard card stock. A piece of kraft card stock was cut and stamped with one of the leaf images from the Penny Black set Foliage Fancy using VersaMark Champagne Dazzle ink. Some cream twine was added to the piece and it was adhered to the card stock piece as shown. The Foliage Fancy set has three different leaf images. Each image comes in a solid and outline form. The solid images were stamped first using different combinations of the following inks, More Mustard, Pumpkin Pie, Real Rust, Real Red and Chocolate (all Stampin Up!) and the rock and roll technique. Once all the solid images were stamped I overstamped each image with the corresponding outline image. All three were trimmed out and some Old Paper Distress ink was applied. I layered the images using various heights of foam dimensionals. 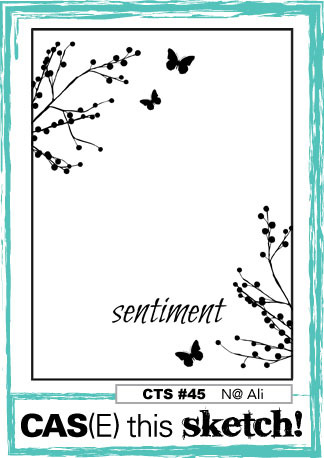 The sentiment (also from Foliage Fancy) was stamped on a banner cut with one of the banner die from the Penny Black Tagged die set, inked with Old Paper distress ink and added to the card. Hello friends!! Hope you have been having a good week!! No complaints here. We have been having unusually nice weather here in the PacNW so it hardly seems like fall is right around the corner, but it is!! 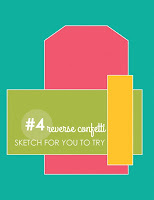 I have a little card to share that I made for the current Reverse Confetti Sketch for You to Try. On Wednesday I received some happy mail in the form of brand spankin' new and oh so yummy Reverse Confetti stamps!! So I just had to use one of the sets for my SFYTT offering. I started by die cutting a piece of kraft card stock using a die from the SU! Apothecary Accents die set. I then trimmed a piece of patterned paper from the Crate Paper Farmhouse pad to fit behind and adhered it to the card base. A piece of patterned paper from the Teresa Collins Fabrications pad was trimmed per the sketch, stamped with the sentiment (using Hero Art's Cup o' Joe ink) from the RC Forever Fall set and the edges distressed. The fun woodgrain image from the same set was stamped on cream cardstock (using Hero Arts Butter Bar ink), trimmed down, inked with Ranger Old Paper distress ink and the edges distressed. Finally I stamped the cute little acorn image from the set 3 times using kraft ink and 3 times using Hero Arts Pale Tomato ink. The kraft acorns were trimmed out entirely and just the caps on the red ones and then adhered together. Everything was then layered according to the sketch. The entire piece was then adhered to the card base using foam dimensionals. Supplies: Cardstock PTI kraft & cream; Stamps: Reverse Confetti Forever Fall; Inks: Hero Arts, Ranger & Stampin Up! 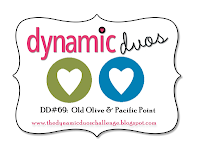 ; Patterned Paper: Crate Paper & Teresa Collins; Dies: Stampin Up! Hello friends!! Tuesday is upon us and that means time for a new CASology challenge!! There were so many fabulous "apple" themed projects in the gallery! 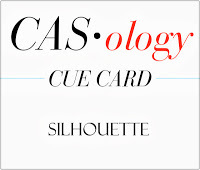 This week the cue word is "silhouette". Our guest designer this week is none other than the crazy mad talented Deepti!! All the details regarding the challenge can be found here. Silhouette... hmmm... many possibilities. Initially I thought I would use my PTI Simply Jane stamp set for this challenge, but instead decided to go with the lovely floral images that are found in the My Favorite Things/Lisa Johnson Designs Peaceful Wildflowers set. 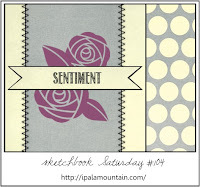 I paired the images with the MFT/Mona Pendleton Designs Distressed Background Blocks. 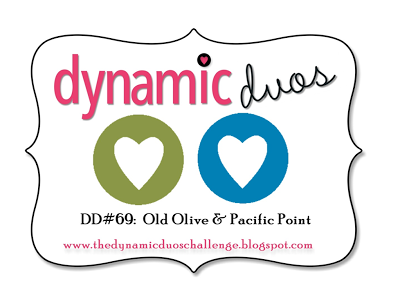 I used the Dynamic Duos color combo of Old Olive and Pacific Point, as well. I love to layer stamps and so did a little of that on this card. Layering your stamps allows you to create a clean design that has little or no bulk to it (unless you are like me and pop your main panel up using foam dimensionals!) Card is pretty self-explanatory. Decided to mount the panel on a black card base to make the colors pop a bit more. Thought about adding a few sequins, but decided against it to keep things really simple. 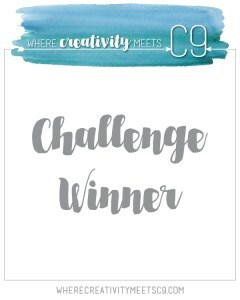 Thanks for stopping by...I cannot wait to see what fun "silhouette" ideas all you super talented paper crafters come up with for this challenge!! In the meantime make sure you check out the cards from the rest of the design team: Melissa, Judy, Meghan, Ardyth, Gillian, Maureen, Kimberly, Jen and Tracey and our guest designer, Deepti. 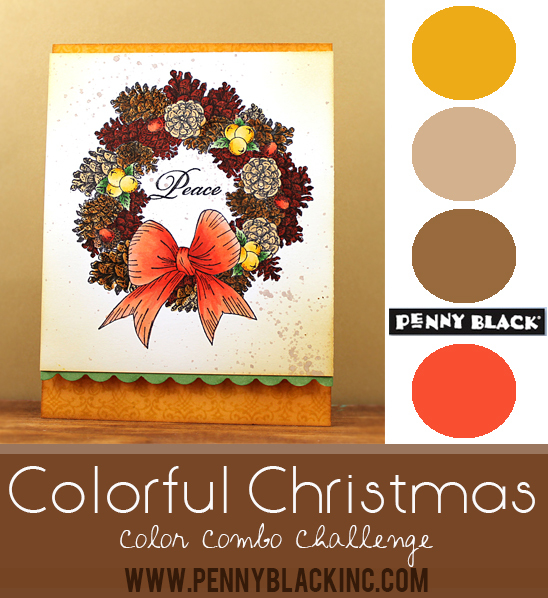 a colorful challenge from penny black!! Hello friends!! Popping in with a little post to let you know that there is a fun new challenge going on over at the Penny Black blog. Each day this week a new color combo will be reveal and you will have until September 27th to play along. The PB design team will be featuring cards that have been made using the combos and the brand new PB Christmas stamps, but your projects can use any PB stamp you wish... just make sure to use one of the color combos!! Click over to the blog to find out all the details. I will be back later this week with a little project I made using one of the combos and look for me to post more projects using all the combos during the following weeks! As there are fun prizes involved (of course!! ), I hope you will pull out those Penny Black stamps and play along!! Hello friends!! Well we made it through the first week of school and I'm dead tired. Getting the big kid an alarm clock tomorrow so we can make sure that he gets up on time! Have a little card that I made last night using the current layout from CAS(E) this Sketch. I must admit that when I saw the sketch my first (and pretty much only thought) was "rainbow"! I did make sure to flipped the sketch so that my rainbow wasn't upside down, lol! I have had the MFT rainbow die-namics die for longer than I care to say and have NEVER USED IT! I have wanted to, but never found the right project... thankfully that project finally came along. To make sure that my rainbow contained all correct colors I googled rainbows and found out that the colors are as follows: red, orange, yellow, green, blue, indigo and violet. I dug around in all my cardstock scraps, found corresponding colors and fired up the ol' Big Shot. Assembling the rainbow was a bit tricky, but with the help of some tape I got it done. The cloud is a PTI die and the sentiment is from the Reverse Confetti set Dream in Color. After adhering the rainbow I added the cloud and sentiment. A few sequins finished things off. Thanks to a visit to the blog of the wildly talented Deepti I discovered that this week's CAS - Colours & Sketches challenge is rainbow! So I will be linking my card up to that challenge, as well as this week's Fetti Find. Hello friends!! Popping in with a quick post to let you know that I have some projects posted over on the CardMaker blog today! 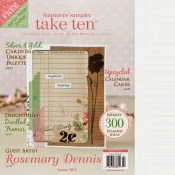 Myself and several of my CardMaker blog team members are sharing projects that we made with stamps from 100 Proof Press. My blogging friend, Martha, is the queen of tag cards and she was the inspiration behind my 100 Proof Press projects. Here is a little peek of one of my projects... I hope you will take some time to check out the post!! Hello friends!! First day of school for my boys and it was a bit of "touch & go" this morning getting the older one out the door and to the bus stop on time. We got up a little late and he only had 10 minutes to get ready!! But he made it... YAY! Things went much smoother getting the little one to school.. 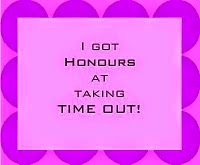 thankfully!! Anywhoo... have a card that I made using the current ColourQ combo and the layout from Retro Sketches. Since I used Reverse Confetti I'm linking this up to their Fetti Finds link list. 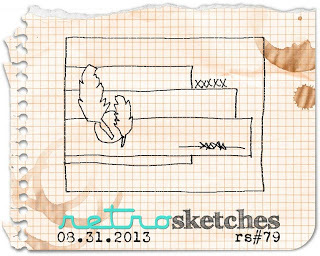 I stamped the feather from the RC set Peacock Pretties using Memento Rhubarb Stalk and SU! Regal Rose inks and then trimmed them out. Still hoping that at some future date RC will start offering dies because that feather is killer to trim out! 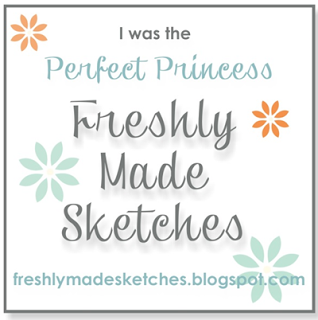 A second image from Peacock Pretties was stamped on a strip of white cardstock using London Fog ink, the centers colored with Memento markers (Rhubarb Stalk & Lady Bug) and then the sentiment from Peacock Pretties was stamped using Tuxedo Black ink. The edges of all the papers were distressed a bit before I layered them up on the card. Hello friends!! Tuesday has rolled around and that means time for a brand new CASology challenge!! In some parts of the US school has already started, but here in my area of Western Washington school starts on Wednesday, September 4th. So with school in full swing our cue word this week is appropriately... apple! And our guest designer this week is the very talented Sandie!! All the details can be found here on the CASology blog. After my little break last week I was ready to dive right into this week's challenge and knew exactly what I was going to be making. I really like it when that happens because honestly I often struggle with the cue words! Anywhoo... I have this lovely teacher themed set from Verve called "Teachers Count". The set also has a cute little set of coordinating apple dies. I die cut the apples and then stamped them with the corresponding apple and leaf images. The little banner was die cut using another Verve die from the "Flag It" set and stamped with the sentiment. Before arranging all the pieces on the card stock piece I ran the cardstock through my Big Shot with a piece of burlap to create the texture. I know that a certain stamp company came out with a burlap coverplate recently, but honestly if you have a piece of burlap you can create a nice subtle texture on your cardstock for a lot less! All the pieces were attached and then little bits of twine were tied in bows and adhered to the apples. A very simple, but classic CAS layout. I'm going to pop this card into the current Curtain Call Inspiration Challenge: Back to School. Hello friends!! 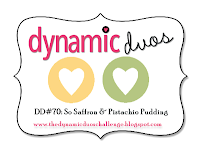 Playing along with Dynamic Duos today. 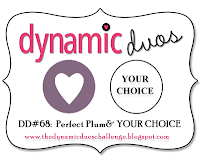 The colors this week are plum and your choice... my choice ended up being brown as you can see! 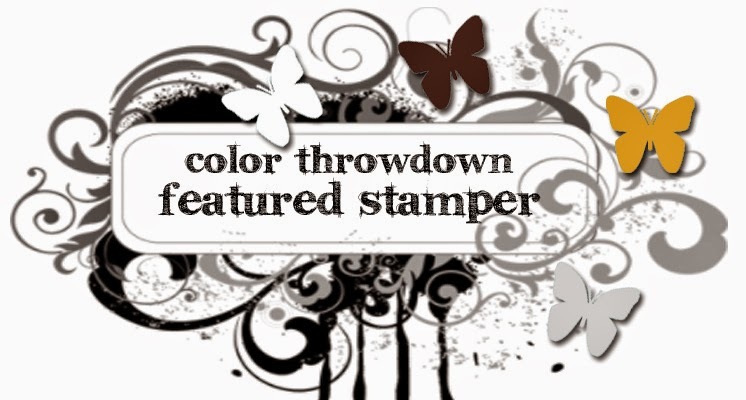 I'm also popping this into this week's Less is More challenge to use a rubber stamp... but I didn't water color the image. The Penny Black design team is also playing along at Less is More this week and there is a fabulous Penny Black prize up for grabs! Several months ago I purchased the Penny Black wood mounted stamp called "melle papillion". I just loved the whimsical look of the young girl surrounded by all those sweet butterflies. I stamped her on white cardstock and colored her with Copic makers in very soft shades of purple (or plum). The brown comes in due to the fact that I colored her hair brown. The butterflies were colored a darker plum color and then Diamond stickles were added. The sentiment is from the Penny Black set "edge to edge". The card base is Stampin Up! 's Wisteria Wonder... a very soft shade of plum.